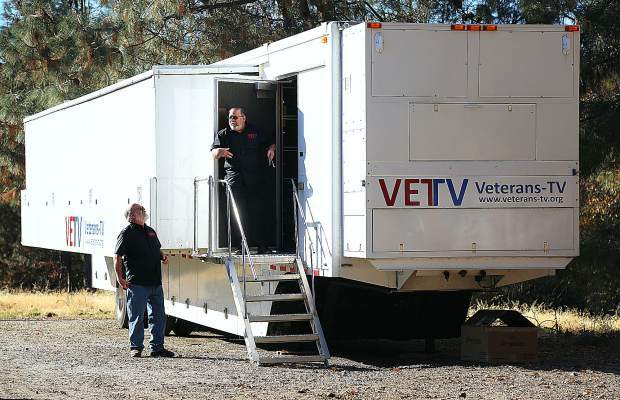 Lee McCallum (from left), and Bob Lefcovich, stand in front of the donated trailer that will be refurbished to train veterans in the television business. Sunday marks the 100th anniversary of the World War I Armistice. In advance of this milestone commemoration, and Sunday’s Veterans Day ceremonies in western Nevada County, The Union and TheUnion.com will share stories on area veterans, including those who made the ultimate sacrifice in World War I, as well as our modern day soldiers and their service. Columnist Terry McLaughlin writes about local plans to honor our veterans. Historian Linda Jack writes about British and Canadian military recruiting efforts of Grass Valley miners in World War I. Letters home to western Nevada County from soldiers who served during World War I will take readers 100 years ago back in time. The Union Staff Writer Jennifer Nobles writes about a special gift for Cody Rice, a local veteran who works with the Wounded Warriors Amputee softball program. A Veterans Day special section inserted in Friday’s The Union will introduce local veterans and outline the Veterans Day weekend’s schedule of events. If there is one thing Bob Lefcovich knows, it’s television — not necessarily the media so many consume on a daily basis, but the actual science behind operating the equipment necessary to broadcast a program far and wide. Now 72, Lefcovich is retired but his passion for TV production hasn’t waned. After a chance meeting with a veteran who had returned from Afghanistan with little to show for it save a severe case of post-traumatic stress disorder, Lefcovich felt compelled to somehow help veterans who have had difficulty re-entering society. The answer, he said, was found in his original love: television. Lefcovich and a team of television industry veterans have started Veterans-TV, Inc. The objective is to offer professional, real-time, hands-on, cost free television production training to those who have served our country. The efforts of Lefcovich and his colleagues have raised nearly $2 million in donations of modern, state-of-the-art production equipment from companies like CBS/Paramount, Grass Valley a Belden brand, Telestream and many others. To date, Veterans-TV has collected well over half of the items on its wish list. The most significant donation so far has been the gifting of a 53-foot mobile TV unit from Northeast Productions that has served as main control room for shows like the Oscars, the Emmys and America’s Got Talent. “I have 53 years in this business and with everybody involved in this, there’s probably 1,000 years of combined experience working on this truck right now,” Lefcovich said. Now, he said, they need to find veterans who would be interested in their program. Equipment will start being installed in the truck at the beginning of December. The training courses will be free for attendees, and will be available to veteran’s spouses as well. Lefcovich has made arrangements with Sierra College to offer any student interested in practical television production experience no-charge entry into the program, though students won’t acquire college credits. Organizers said the group strives to not be politically motivated and be open to all veterans regardless of race, gender, religion or sexual orientation. Lefcovich is not a veteran himself, though his brother served in Vietnam. He was astounded at the poor treatment his brother received upon his return from war, inspiring him even more to help soldiers reclaim their pre-combat lives. For more information on Veterans-TV, Inc., visit http://www.veterans-tv.org.